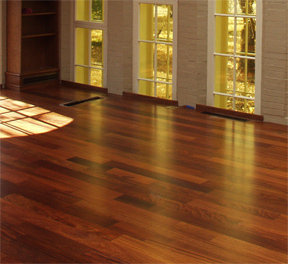 The growing trend in wood and laminate flooring installation is radiant heat. Affordable, efficient and comfortable, radiant heated floors are a welcome way to spend the winter months, and roll up your area rugs too. If you’re looking to heat hardwood or laminate flooring, or add some warmth to your existing wood floors, be prepared to do a little homework. Find the right flooring for the job. Wood and laminate flooring can be safely installed over radiant heat, as long as you are careful to choose suitable products. It’s not the heat produced by the radiant heat source that’s a concern. It’s the humidity in your home. All wood products expand and contract with humidity, and over time, this process can create gaps between your floor boards. Unsuitable materials or a poorly constructed floor greatly accelerates damage caused by humidity over time. Some types of wood floors make better candidates for radiant heat than others, so it’s best to go with the manufacturer’s recommendation for suitable types of wood over radiant heat. Quarter sawn or rift-sawn flooring is more dimensionally stable than plain sawn wood flooring. Strip flooring is also a better choice than plank flooring, because narrow boards expand and contract less (take up more movement) than wide boards do. Because of its inherent dimensional stability, laminated wood is also a great choice for radiant heated floors. Once you’ve chosen the right flooring, it’s important to partner with a reliable radiant heat solutions provider, like Warmzone, to help you choose and install an electric radiant floor heating system under your wood or laminate flooring. At Warmzone, you’ll benefit from an impressive selection of radiant heat products designed specifically for your hardwood or laminate flooring. For new floors, Warmzone HeatShield floor heating insulation panels are a practical radiant heating solution for hardwood and laminate flooring. Installation is simple. There’s no need to embed the heating cables in a mud base. Once you lay the insulation panels on the existing floor, simply press heating cables into the grooves provided, lay the wooden laminate floor directly on top, connect the thermostat and turn on the heat. Made of a ½-inch thick polystyrene insulation covered with a thin, specifically profiled aluminum, HeatShield is designed for excellent downward insulation, and efficiently directs heat upward for the best heat distribution to significantly lower energy consumption. 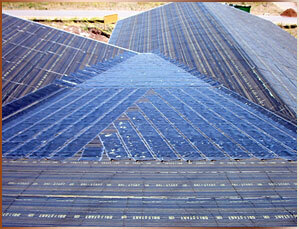 The efficiency of the panels also reduces your floor heating systems operation time, saving you money. 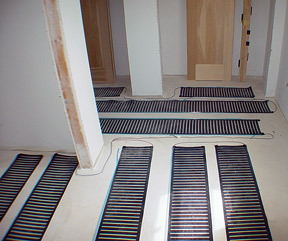 For new or existing floors, self-regulating Warmzone FloorHeat is a unique, low-voltage heating element perfect for installation under hardwood and laminate flooring. This radiant heat system uses a self-regulating semi-conductive polyethylene heating element, and is ideal for both new construction and retrofit applications alike. It is also very thin, making it a great option for installation under laminate and wood, without additional floor build up. 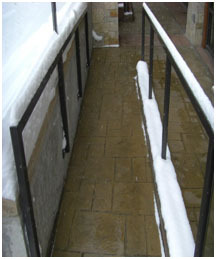 A safe low-voltage product, FloorHeat can also be nailed through without damaging the heating element. This flexibility makes FloorHeat a good choice for retrofitting existing floors. If you can access your floor joists from below, you’re also a perfect candidate for the Warmzone RetroHeat floor heating system. 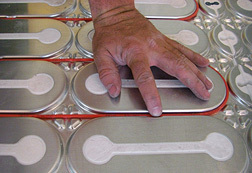 The RetroHeat heating element is easy to install so it makes a great do-it-yourself project. The two most highly recommended options for floors are RetroHeat and FloorHeat. 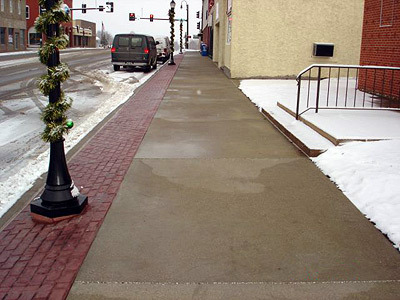 Both systems are very affordable, and allow you to install radiant heat to your existing floors without extensive floor tear ups or remodeling. To learn more about the ins and outs of electric radiant heat for your hardwood or laminate floors, be sure to contact Warmzone at 888.488.9276. 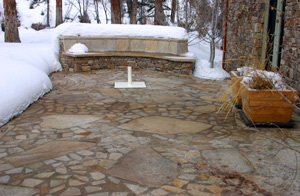 CBS Moneywatch.com recently identified twelve trends in home remodeling for 2011. The hottest projects—bathrooms, must-do remodeling and warmer interior design projects made the top three, with green living coming in at number nine. With growing concerns over rising fuel prices and carbon footprints, it’s not surprising that more and more homeowners are investing in their homes to cut fuel consumption. Installing Warmzone radiant heated floors is a great way to keep up with remodeling trends and recoup on home improvement costs. How does radiant heat work? 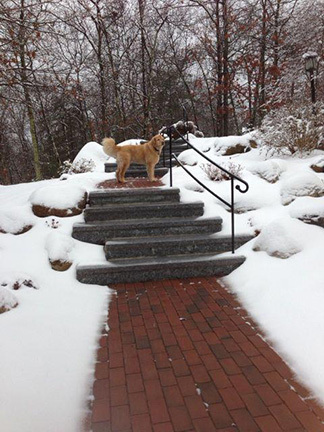 Heated floors radiate heat from the floor up to keep you warm and comfortable when cold weather sets in. Two types of systems—electric heat cable and hydronic (water-based) tubing systems—when installed in the subfloor of your home act as heating elements to warm the surface above. These heating cables/tubing coordinate with a thermostat and sensors, as do traditional forced air systems, to provide heat to your home. Warmzone radiant heat is green heat. Powered by electricity, electric radiant heat cables can heat a surface in 30 to 60 minutes. Unlike forced air systems, they are room specific. With the help of sensors and a programmable thermostat you can heat one room, or heat them all quickly and efficiently, saving money on your monthly gas bill. And unlike forced air systems, they do not belch out the dust and dirt that compromises air quality in your home. A radiant heated floor installation equals cheap equity. Heated floors give your home an impressive level of comfort and customization with minimal investment. Not sure you want to install heated floors throughout you home just yet? Warmzone offers a variety of heat cable products that can be easily installed under the subfloor of any room in your home, whether it be bathroom tile, wood or even carpet. If, as CBS Moneywatch.com suggests, the over-arching remodeling trend for 2011 is to tackle small projects while you wait to do the really big remodeling project that’s on your list, why not start by installing heated flooring in your home. 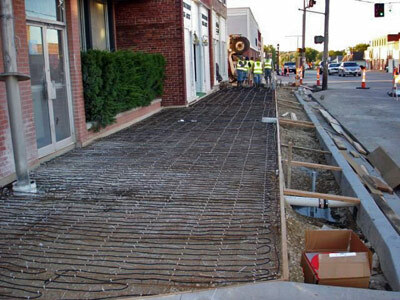 Unlike other “one-size-fits-all” radiant heat providers, Warmzone offers an array of radiant heated flooring solutions designed to better match your individual project, and your budget. 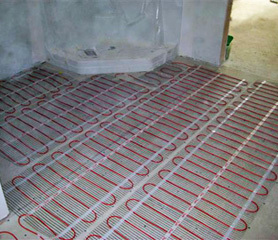 The good news—many of these floor heating products can be installed by do-it-yourself homeowners.